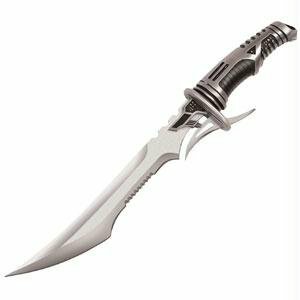 United Cutlery says the Dragon X-10 from the Steel Apocalypse Collection took inspiration from the genre of science fiction and futuristic weaponry rather than any particular movie or gamer blade. Creative minds looking for their own inspiration need go no further in their search for a good story. This ornate weapon of antiqued cast metal and high carbon stainless steel could pass for either sidearm or spaceship. Termed a bowie knife by the company that made it, this collector's blade takes concepts from many good styles of knives and puts them together in unexpected ways. Even though much of it is upside down and backwards, it still looks like a knife that makes sense in a different system of logic. Undoubtedly in the universe this blade came from, opponents wore a special kind of armor and the Dragon sought out the weak points. Sixteen and 5/8 inches long, and over two pounds in weight, this knife is for adults only -- and probably only for cautious and respectful adults. Even without a razor edge, there's enough heavy steel in this knife to cause real harm. The 420 stainless steel in the blade could be found in many more practical knives and deserves respect. The knife is solidly made but with details that could be damaged if dropped. United Cutlery intends the knife for artistic purposes only, and a stand for desktop display should accompany each.